Shady Places offers a professional installation service that is geared to the specific needs of childcare and schooling facilities. All of our employees are security cleared and have ‘Working with Children’ checks. Worksite access is restricted and monitored in the interests of safety and security. Appropriate barriers are erected on site to prevent children from entering the construction area, and worksite access is monitored with a ‘sign in’ system. All staff are required to carry Occupational Health and Safety Red Cards and operate under a formal Work Safety Plan. Shady Places is a Registered Building Practitioner and work is fully insured. This area was designed by the school as an Amphitheatre which they wanted to shade to protect their students from the sun’s harmful rays while enjoying the outdoor learning experience. 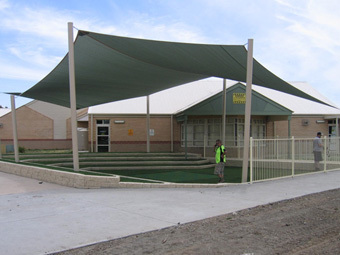 Whether you are looking to purchase a shade sail for schools, childcare centres, kindergartens or university campuses, you will be sure to find the right shade sail or shade structure to protect young children, students and staff from the sun’s harmful UV rays. While the weather may be extremely hot in summer, children can enjoy playing outdoors or studying in outdoor learning areas in a comfortable and safe environment. Today’s shade cloth fabrics provide protection up to 98% from sun’s harmful UV rays, this UV stabilising technology stops the heat from penetrating though the sails and prevents any deterioration or damage from the sun to the shade sail fabric, which then gives you a shade fabric that will last at least 10 years. When utilising shade cloth fabrics in your shade structures, you increase the air circulation and help keep the shaded area cool. Another really useful fabric for shade sails in schools, childcare centres and kindergartens is waterproof shade cloth or PVC fabric. When applied to the right shade design, you can create a shaded area that can also be utilised on wet weather days. A barrel rolled structure made using a PVC fabric for example, can provide the ideal play area, assembly or stage area that can accommodate the whole school. Think of all those Christmas or school concerts and being able to sit outside in the lovely fresh air, without being scorched by the sun or soaked by the rain. You will have protection against all weather conditions as these shade sails for schools are waterproof and offer the same UV protection qualities as shade cloth, so you can continue to enjoy your event without any interruption. 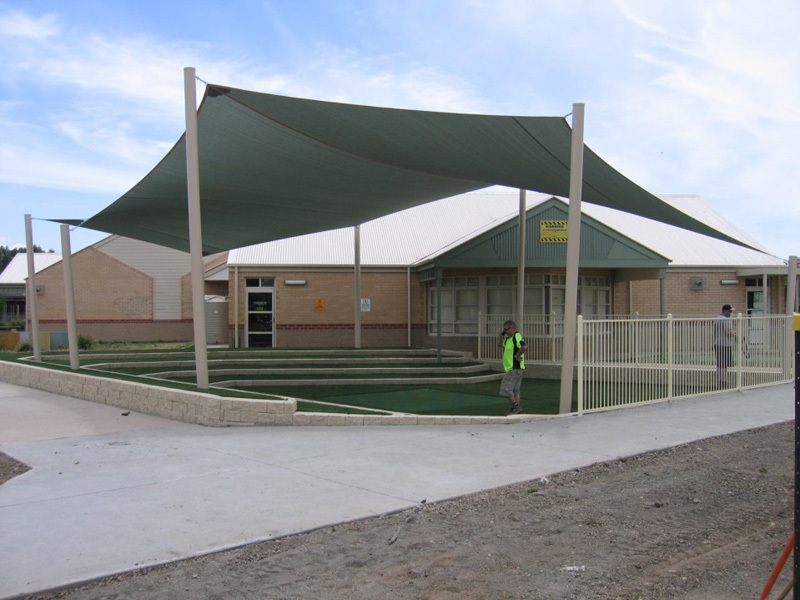 We offer shade sails for schools in various designs and sizes. No matter how small or big your school. Whether you are trying to cover a small courtyard or a large open space area, we will give you exactly what you are looking for. Light colours have light heat absorption and dark colours have intense heat absorption. You can choose whatever colour suits your school premises, knowing that all fabrics and colours supplied will provide you with the required amount of protection. No matter what the shape of your shaded area may be, you name it, we can design it.Even if you have an odd shaped area, we will custom design a shade to suit. 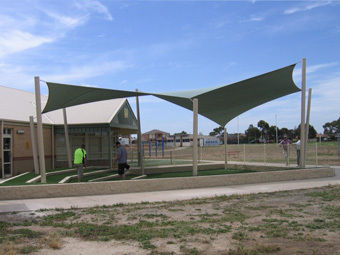 t is a requirement from the Work Safe – Early Childhood Development and Victorian Education Department that shade sails for must be manufactured to specific guidelines. The shade must be audited once a year. After every three years an engineer must complete a safety audit. At Shady Places we offer our clients a three-year maintenance package to carry out safety inspections on all their shade structures. We also supply an engineer’s report every third year as part of our proposal. 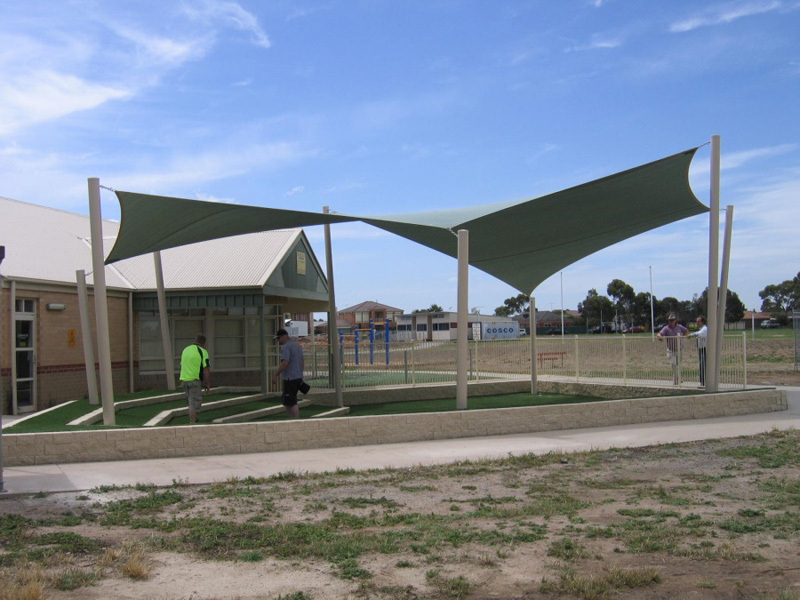 You can rest assured that we engaging our services, we will take all the safety precautions required before installing any shade sails for schools, childcare centres or kindergartens.